Next year, we'll have a tractor like this. 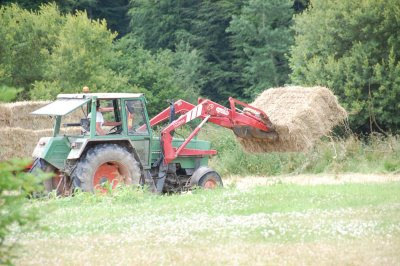 The hay is made in various shapes of bale, this year M. Vincent has made two sorts, the very large oblong bales here (there are two on the forks) and some rolls about a month ago. I think he must have to use what equipment he can borrow. If we can, we'll get a small baler. It can be powered by a smaller tractor, the bales will be easier to manhandle on the field and I think they will sell more easily to the amateur horsey set too. Sorry I've not been posting much. I'm trying to put together an obit for the Bad Black Cat and I can't find the photos and it's all too sad. His kidneys failed and we had him put down on the 28th June. We're missing him. so sad to hear about bad black cat - as you know i had to have our black dog put down today so i really feel for you. hugs. Thanks Joker, hope things are getting better again.